I was introduced to this lovely bottle of Sauvignon Blanc at the Willcox Wine Festival. After taking a bottle home and finding that I was savoring every sip, I felt the need to highlight it here on W2WK. Winemaker’s Tasting Notes: I’m a sucker for great life change stories… So I must share. 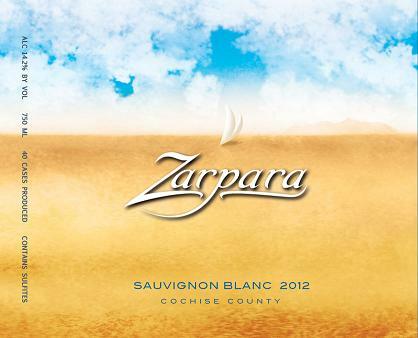 As explained on their website, the Zarpara Vineyard owners retired from the “daily grind” to start their own vineyard in Cochise County (southern Arizona) where they planted vines and started making wine. And this Sauvignon Blanc is their first wine from grapes harvested solely from their vineyard. To that I say, Bravo! They also note that there were only 37 cases of this wine produced, so it might be tough to find. UPDATE: For you Phoenicians, Zarpara Vineyard commented below that their Sauvignon Blanc is available at Wedge and Bottle in Ahwatukee. Divine Bite: Sauvignon Blanc is a very “food-friendly” wine. It is a dry white and can accompany spicy foods and other dishes with strong flavors. Because the wine is low in acidity, it is enjoyable with foods that have high acidity, like goat cheese or tomatoes. Try this with a salad that includes an acidic cheese. It also pairs very well with most seafood dishes. I enjoyed this bottle with grilled Mahi seasoned with Chesapeake Bay seasoning and some steamed vegetables. The winery recommends having their wine with garlic marinated shrimp or with feta cheese and some olives. Enjoy! Tasting Notes: Here’s what the winemaker says about its ViNO Pinot Grigio. Divine Bite: So what to enjoy with a glass of ViNO? Pinot Grigio tends to be a great wine for lunches and appetizers, or foods with high acidity. Try it with salads or a shellfish dish. The winery recommends oysters, which would be complementary with regard to the mineral flavors in the oysters as well as the wine. I enjoyed this wine with salmon topped with arugula/parsley/lemon pesto. The crisp herbal and citrus flavors of the pesto accompanied the ViNO very nicely. Let’s add some worldliness to our palettes, and a little precious popularity to this wine while considering its potential delights! Wino Assessment: So I was preparing for a dinner party one day and had planned to make a recipe out of Karen MacNeil’s cookbook, “Wine, Food, & Friends”. The dish was a pork tenderloin with nectarine-apricot sauce and it recommended the meal be paired with the Dr. Loosen Ürziger Würzgarten Riesling. So I mosied on down to one of my favorite Phoenix wine shops (Sportsman’s) in pursuit of a riesling that may serve as a decent substitute for this pairing recommendation. After all, I never thought that of all the gazillion rieslings that are on the shelves out in the wine world, that I’d come across THE WINE that Ms. MacNeil recommended in her book. Especially not at this small wine store that probably carries only a dozen rieslings in total. But, much to my giddy delight, right there on the riesling shelf was THE WINE…. Dr. 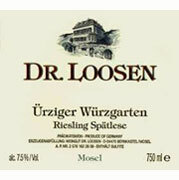 Loosen Ürziger Würzgarten Riesling. Now I don’t often go spending over $30 for a bottle of wine… but how could I go on knowing this wine was sitting on the shelf at my local wine shop and recommended by a world famous wine expert with the dish that I was making that evening for dinner? I couldn’t. So in my wine bag it went, along with that winery’s less expensive riesling. There’s no doubt about it. This wine is sweet. Rieslings have their own classification/style designation that indicates their level of sweetness. This one is a Spätlese, which is one of the drier rieslings. But to me, and to the other Winos around the table, this wine still tasted very sweet. What was interesting to me was the complexity of the wine despite its sweetness. While almost like liquid sugar, it also maintained a sort of crispness that reminded me of honeydew melon. There were lots of soft peach and apricot flavors in it as well. So while I ordinarily don’t love sweet wines, I feel that this one piqued my interest in sweet white wines, especially when paired with the right dish. 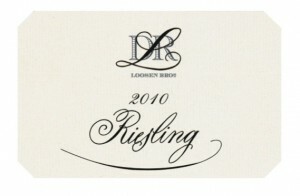 The Dr. L Riesling was also sweet but seemed to have more of that crisp fruit flavor to it. Both went down very easily! Again, perhaps relative to other rieslings, both of these may not be terribly sweet. But if you pick up a bottle, expect it to be a sweet white wine with lots of citrus and melon flavors. Diving Wine Bite: Riesling generally pairs well with sweet or spicy dishes. That goes back to the pair sweet wine flavors to sweet food flavors, or complement the spicy factory in a dish with the sweet wine. So rieslings tend to go well with Asian or Latin dishes. As noted above, I enjoyed this wine with pork tenderloin with the nectarine-apricot sauce, which included some jalepeño. This sweet flavors in the sauce aligned nicely to the sweet flavors of the wine, while the spicy factor with the jalepeño served as a contrast to the riesling. It was a great pairing! Give either of these bottles a try! Let me know what you think! And let me know if you have other rieslings that you’ve enjoyed! Wine is always best when enjoyed with good company… and I had the pleasure of enjoying this week’s Divine Wine with several of my favorite people over a long dinner (and several bottles of happiness). Wino Assessment: Pinot Noir is one of my favorite overall wines (oh wait – most wines fall into this category for me!). It is great with appetizers, with a meal, by itself, in the afternoon, in the evening. It’s just versatile. And who doesn’t love good versatility? 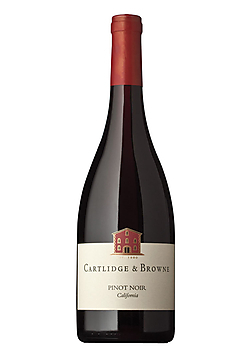 The Cartlidge & Browne Pinot is a great “standard” Pinot Noir. It has all the typical flavors that you might find in a Pinot – a little earthy/oakiness while also having some soft fruit (strawberry/cherry) which balances the overall flavor. While enjoying with my friends, we all agreed that it was very smooth, easy to drink wine. Divine Wine Bite: Now that you have the bottle, you’re wondering what the heck to eat with it. (And yes, I firmly believe that all good meals are planned around a good bottle of wine.) Since this particular Pinot Noir has the earthy flavors as well as soft fruit and spice flavors, it can really go with a variety of dishes. Enjoy it with hearty meats such as lamb or veal. It also pairs beautifully with salmon. Keep in mind that to pair wine and food together well, look for common or opposite characteristics in both. Maybe prepare your meats with a mushroom sauce (matching smooth flavors in the food to that of the wine). If you pair this wine with salmon, try it with a rich red wine reduction or a glaze of sorts. Looking for a specific recipe? Try this Sesame Encrusted Salmon with Pinot Noir Reduction. This is the dish that I enjoyed with friends and this bottle (or bottles) of wine and we all agreed the combination of the dish with the wine brought out flavors in both! Does anyone actually eat a goose on Christmas? I don’t think I’ve ever even had goose, holiday or not. Hmm. However, I believe many people have turkey or a roast of some sort on Christmas Eve or Christmas Day. So with that thought in mind, I offer what I consider a fine wine suggestion to accompany your holiday meal! So I’m making a liar of myself on W2WK. In my relatively recent Thanksgiving post, I noted that I planned to bring the Tobin James Ballistic Zinfandel to my Thanksgiving celebration with the family. However, I ran out of time to hit up Costco, where I know they carry that bottle…. Instead, I went to Sportsman’s Wine and Spirits – one of Phoenix’s best wine shops! And I have to say, I’m pretty glad for my time crunch. Sportsman’s is one of those places where the employees know their stuff and provide great suggestions. I ended up with four bottles of wine for our four-person celebration. The Ridge Lytton Springs was the one I was most excited about, and turned out, the one I loved the most! Wino Assessment: I was scouring my wine books for what to eat with a Turkey dinner. And the books (specifically, What To Drink With What You Eat), suggested a Zinfandel. And as soon as I read that, I could feel my taste buds getting happy. The savory, salty dinner that usually makes up a traditional Thanksgiving meal, and likely a similar set of savory dishes for Christmas meals, is an excellent balance for a big, bold, fruity Zinfandel. Ripe black cherry/raspberry nose, with notes of pepper, licorice, chaparral, and tobacco. Rich black fruit on the palate. Full, viscous. Well-coated tannins and a long, layered finish. Side note about Ridge Vineyards – they have several vineyards throughout California, but Lytton Springs is in the Sonoma County area. 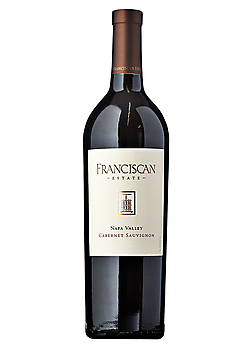 I was first introduced to their wines by my Brotha Brian (he’s actually my brother… not a priest. However, he does hold internet-approved certification as a wedding officiant!). Anyway, we were celebrating his wife’s birthday at my house one year (2008, I think) and he picked up a bottle of a Ridge wine. I don’t recall if it was this one or another. But whatever we drank that day has stuck with me as a memorably divine wine! Over the past year, I’ve grown to become a fan of Zinfandels. In my book, these are wines that are meant to be enjoyed with food. I think I may have been turned off by Zins before because I was probably just drinking them on their own and, therefore, may not have appreciated the flavors that would have come out if I had it properly paired. The Bite: So… we know this goes well with a Turkey dinner. It probably goes well with one’s Christmas goose. (If you have goose for Christmas, or in general, please let me know. You may need to guest blog about it.) But try this wine (or other Zinfandels) with other heavy, savory meals like a roast, steaks, lamb, and even burgers. It will also be a nice balance for spicy meals – especially spicy Asian beef dishes. Let me know if you give this bottle a try! It will not disappoint!! This weekend marked a milestone for my family… my Dad officially entered “retired” status as of Saturday… a change that will allow his impressive energy level to be dedicated to other lovely life activities… like boozing on sparkling wine on a Saturday afternoon. And that’s exactly what we did to celebrate his new life “status”. Seriously, is there a better way to spend your first Saturday of retirement!?! Wino Assessment: I am admittedly a bad judge of sparkling wine. I like them all! And I struggle to find the differences in taste… so my Wino Assessment is going to be lackluster at best. 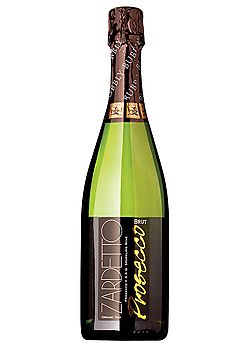 It is a dry sparkling wine, but not bitter – it hint of a honey like sweetness to it that balances the dryness nicely. I presume you are already grabbing your keys to run out and grab a bottle of this enjoyable bubbly, given all these great descriptions! So what to munch on while enjoying this Prosecco? Since sparkling wine is normally enjoyed as an aperitif, these pairing suggestions are in the nature of appetizers/small bites. Most lighter bodied Proseccos, like this one, go well with salty foods like prosciutto or smoked salmon. You might even consider enjoying this with a bit of sushi (which seems counterintuitive to me, but now that I’ve had the wine, I wish I would have had it with sushi!). If you’re looking for a lighter snack, try it with some a little bowl of mixed nuts! May we all celebrate the little things and the big things in life with a delightful bottle of bubbly! And many congrats to my Dad and looking forward to sharing many more bottles of bubbly with this new retiree! Source: Source for all wine know (particularly with The Bite section) is What to Drink with What You Eat. Did you Winos ever see that movie, Sideways? It’s about two dudes taking a road trip into wine country as a sort of bachelor party for one of them. The other is a bit of a Wino (or perhaps a Wine Know). And throughout the movie he talks about his dislike of Merlot. Because the movie had a sort of cult following, it actually did make an impact on the wine industry due to less popularity with Merlot purchases. Oh Hollywood… you ARE powerful after all. Anyway, I admit that this Wino is just returning to Merlot drinking after seeing that film. And yes, I am embarrassed to admit that. But I’m here to say publicly that I have reopened my taste buds to Merlot and, so far, have very much enjoyed them! So today’s Divine Wine is a personal celebration of Merlot and one that I think you Winos will enjoy as well! Wino Assessment: Ok, so this will sound a little cheesy. But I swear upon trying this wine, I truly understood what it meant when someone described a wine as “velvety”. It is literally a soft smoothness to the wine that quite frankly tastes like you’re drinking liquid velvet. This wine is obviously smooth, and while it has some fruity flavors (I’d say a hint of strawberry), it also maintains a nice – but not overwhelming – dryness. 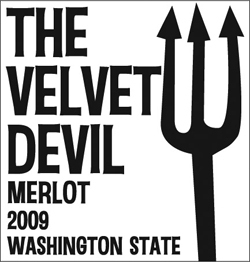 I suppose the “devilish” part about this wine is that you just want to guzzle it. I kinda wish all wine descriptions were as exciting as this one. Obviously, I agree – it IS pure velvet! Merlot has a lot of tannins which gives the wine a bit of a bite (among other characteristics that give the wine “structure”). But because it is rather hearty, Merlot goes well with hearty dishes such as lamb or beef tenderloin. 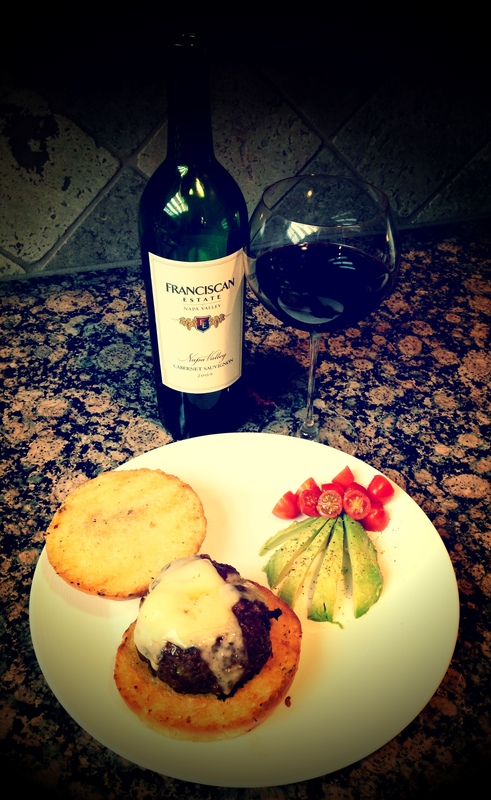 For my veggie Winos, try some Merlot with your next eggplant parmesan or portabello burger. You will enjoy! While hanging out with family along the Chesapeake Bay, it is practically a requirement to have a CrabFest. If not, it would just be a downright pity. So, of course, we had a CrabFest (to avoid pitying ourselves), during which I popped open a bottle of this week’s Divine Wine of the Week. And I was rather delighted by this pairing! This wine was delicious! As W2WK followers may know, I’m a big fan of Viogniers in general. But I was first introduced to them via Virginia, so perhaps my heart is connected to Viogniers from this region. The Horton Viognier was particularly delightful. It was creamy and smooth but had that buttery honeysuckle flavor. It’s easy to drink, especially with something salty and fishy (such as blue crabs). I hope some of my fellow tasters of this wine (slash family members slash W2WK loyals) comment regarding their thoughts on the wine. “Honey and tropical fruit” are definitely what I recall (just didn’t think of that fine ‘tropical fruit’ descriptor when writing my assessment!). 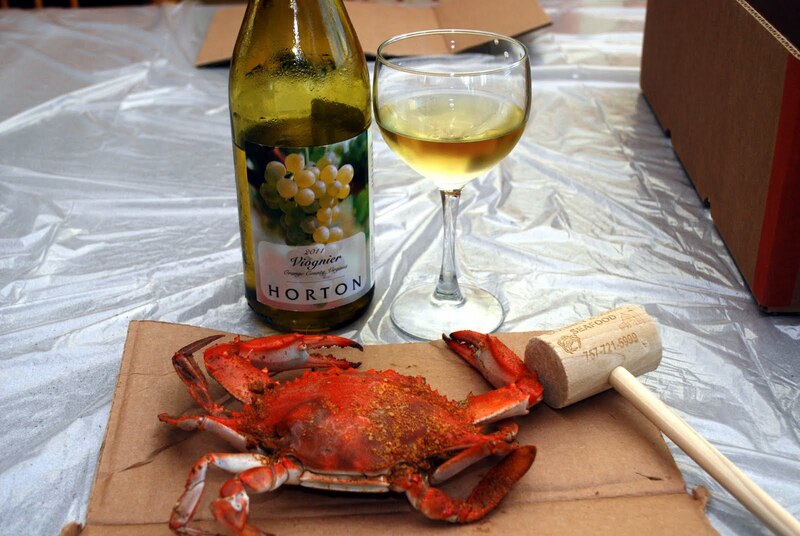 You can read more about Virginia’s Viogniers in this very interesting article from the Washington Post which talks about Horton Vineyard’s Viognier beating out California Viogniers in a tasting contest a few years back. So beyond blue crabs from the Chesapeake Bay with extra Old Bay Seasoning on them, what does one eat with Viogniers? Well, since Viogniers are typically very aromatic, they go well with dishes made with aromatic ingredients. This may include things like ginger, lemongrass, chile past, fish sauce, curry powder, cilantro, and lime (and yes, Old Bay Seasoning). Pairing sweeter wines with salty dishes can be a nice balance. While Viognier isn’t particularly sweet, it has that floral element that accompanies the salty and spicy dishes nicely. So next time you’re enjoying a Thai dish or another spicy Asian dish, try it with a Viognier and report back! Winos! Oh how I have missed you! My apologies for the unplanned W2WK hiatus… Let’s chalk it up to needing a little time to transition from spring to summer wines… Now “seasonal wine” is not an official categorization of wine or anything. (Well, not as far as I wine know.) But I do know that for me there is a direct correlation between the increasing heat and the increasing desire for crisp and cold white wines. So let’s consider this post the first W2WK post of the summer. Why? Well, (a) it is hot out… at least in Arizona, (b) I’m on a beach vacation while writing this post, and how does that not scream summer? !, (c) I’ve been wanting to post about one of my favorite “summer” wines…. Vinho Verde. Wino Assessment: This wine is great for a hot afternoon by the pool or by the beach. It is crisp and light with an appley/peachy flavor. And it also has a little bubbly factor to it, making it taste more like a “wine spritzer”. It’s definitely one of those wines that you keep drinking thinking it is fancy flavored soda, but then you stand up and realize that, no, it is in fact a beverage with alcohol. The Wine: Vinho Verde is from the northwestern part of Portugal (Minho) – agriculture country. Most of Portugal’s white wine is made in this region… and if you are an astute Wino, you may be thinking, “but isn’t Vinho Verde a green wine?”. Well, Winos, I’m here to tell you it is not. (Even though they usually bottle Vinho Verde in a light green bottle possibly leading you to wonder about its color twice over.) So while it does mean “green wine”, the green is in reference to the fact that it is a young wine that is meant to be enjoyed very soon after it is made. So what does one eat when enjoying some Vinho Verde? 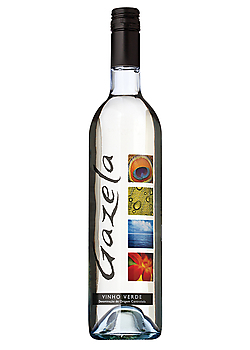 While I generally think any sort of summertime cook-out or BBQ could be enjoyed with a bottle of Gazela, it will go best with seafood or a more oily dish with a lot of strong flavors. Try it with grilled salmon or shrimp. 1. While Vinho Verde has a little spritz to it (coming from a dose of CO2 just before bottling), it is not classified as a sparkling wine. 2. “A large percentage of Vinho Verde is not white but red.” (The Wine Bible) This was definitely news to me. Apparently the red Vinho Verde is not exported outside of Portugal, so if you happen to be galavanting around Europe, stop in Portugal for a little of this special blend and report back!